I love cold noodle salads, but my husband….not so much. Mainly because most of them either call for mayonnaise or a bottled dressing, neither of which he is particularly fond of. So I decided to try one with an Asian vinaigrette, we’ll see what he says! This entire box is also Gluten-free. 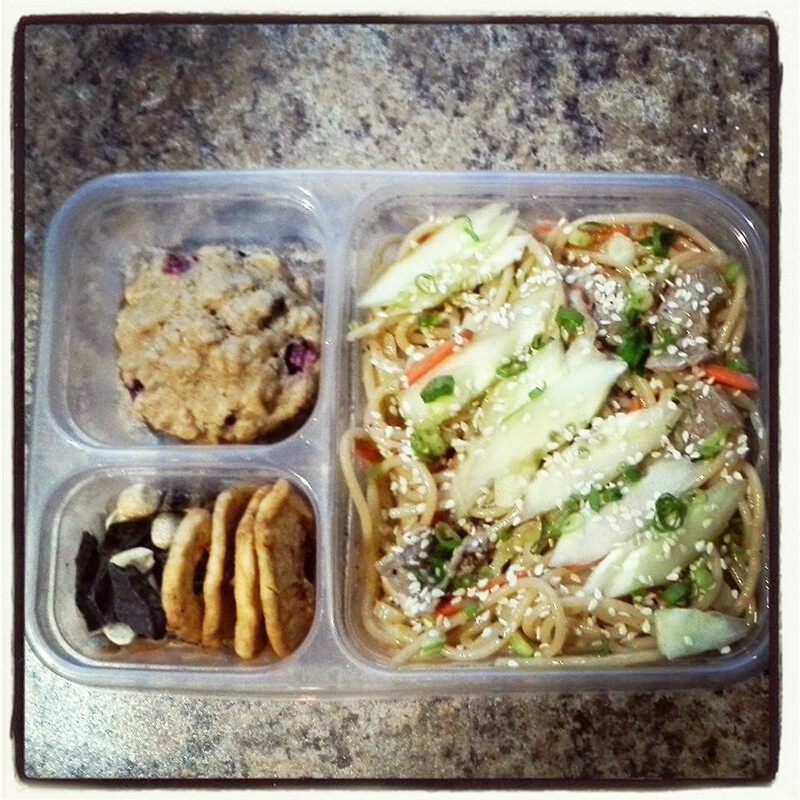 Asian noodle salad with sesame-ginger soy vinaigrette – I used this recipe as a jumping-off point. The vinaigrette itself was a little sweet, especially if you are also adding in the Sirracha/rooster sauce (the sambal oelek), so maybe start out with a little less. I also added in 1 clove of garlic (pressed), black pepper and hot chili oil to make it spicy. I never have soba noodles, so I used spaghetti noodles. ADD INS: carrots,cabbage, green onion, sliced beef, sesame seeds, cucumbers. Blueberry – Oatmeal muffin – I used one of my favorite muffin recipes and made it GF by using brown rice flour. The other part of the box contain unsulfured dried apple rings & semi-sweet chocolate from Trader Joe’s, as well as some roasted/salted peanuts.